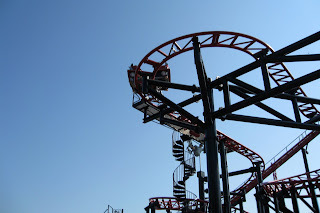 Dan surprised me yesterday with a trip to Six Flags Discovery Kingdom. We had so much fun, I felt like such a little kid. The swing ride used to be my favorite back in the day. That was before I got into riding roller coasters. I still have a huge fear of heights, but I love the adrenaline rush I get from them. Did you know you aren't supposed to take pictures on rides? Even if they are the little kid ones? I'll just add that to my list of places that I've gotten in trouble for photographing... If you take pictures lots, its bound to happen! 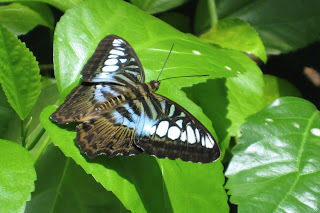 I channeled my grandfather for a short time while I was in the butterfly area. Great place to photograph them since they are all over the place. I remember one time my grandparents came back from a trip and they had a cocoon. I thought it was so cool. I brought Jenna's little point & shoot canon elph 850IS. Love that it fits in my pocket but I really missed my super fast shutter. I got a little frustrated that it didn't capture what I was really trying to get. Made me appreciate what each camera is made specifically for. Rode on 4 roller coasters and that was enough for me. Below is the Tony Hawk Big Spin. We also went on Medusa, Roar, and Kong. Medusa was my favorite. It might have been because it was the first one we went on that day. 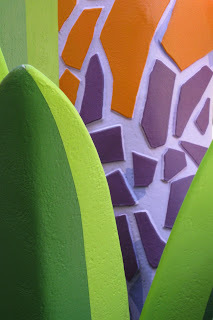 I really tried to retrain my eyes on finding abstract photos as the park. I adored the colors of this elephant. And my favorite part of the day was getting to take photo booth pictures. I have quite a collection of them from over the years. This is my first photo strip with Dan. The first two are overexposed because a little kid was playing with the curtain. Oh wells. My second favorite part of the day was going to see the Bengal and white Bengal tigers. We didn't see the show but I did time it so the trainers were out and answering questions. I had to know when the big cats were born for a very important reason. I was really lucky back in 2001. Gary, our family friend, had a friend that was a vet/trainer at Six Flags. 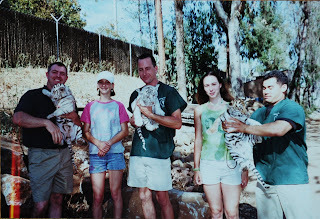 For my 17th birthday he got me behind the scenes to meet and play with 3 cubs that were rather young. 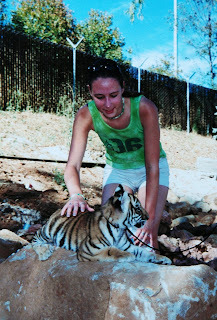 This was huge to me, since white Bengal tigers happen to be my favorite animal. So here I was looking at two fully grown tigers that were each 7 years old. And they were cubs in 2001. It was really special for me to see them still there and lively. I didn't take pictures of them through the fence. Ok, sappiness over! All in all, my day was wonderful. We ate lots of unhealthy food and it was just the perfect summer day. I love days like these. Oh thanks for visiting my blog. I love six flags, I bet it was so much fun. I too share your fear of heights. Your park pictures are awesome!!! Love the shot of the coaster! How cool is it that you got to be up close to those tigers! That is one cool birthday gift! Hey sweets,when are you going to Europe??????? ?Are you comming to Holland too?Let me know,so we can hang out k? I LOVE Six Flags! I miss living in Texas, and having one less than an hour away. We don't really have anything close to where we are now. Glad you had so much fun, and got some FABULOUS photographs! aww, those tiger cubs are so cute!! 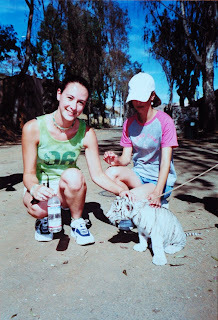 I want a pet tiger lol! 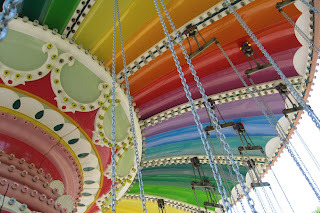 oh yeah, and do they yell at you if you try to take pics on the rides? Is it just cause theyre afraid youre going to lose your camera?